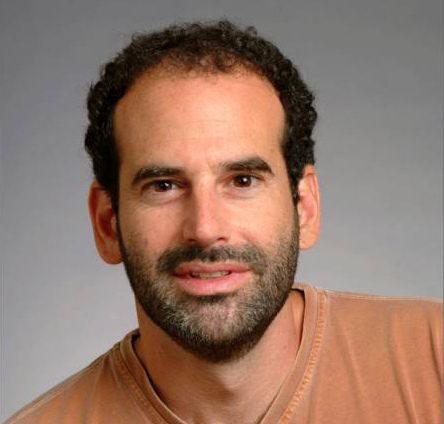 On July 1st, our leader, colleague, and friend Professor Seth Teller passed away. MIT News has an appreciation of Seth's life and work. If you would like to share your thoughts, stories, and pictures of Seth, please send them to rememberingseth [at] csail.mit.edu; they will be shared with his family and be posted online at a later date. Please indicate whether you'd prefer your thoughts to be shared anonymously. Our thoughts are with his family at this difficult time. This page describes some of our efforts as part of the DARPA Grand Challenge to develop a full-size autonomous passenger vehicle. Team MIT was one of only 6 teams (out of 89 original entrants) to complete the DARPA Challenge, which required the vehicle to drive itself (with nobody inside, and no remote control) through an urban-like area. Non-linear optimization has traditionally been considered out-of-reach of most SLAM applications do to its computational cost. However, a family of iterative batch algorithms has recently demonstrated remarkably fast convergence. Because they are batch algorithms, however, they are not well-suited to online applications. In this work, we extend the reach of these algorithms to incremental applications by describing a way of maintaining spatially-adaptive learning rates, and a way of accelerating convergence by preferentially optimizing the least-converged parts of the pose graph. We are developing robust methods for estimating 6-DOF pose in world coordinates from omnidirectional video, given a crude geometric model of the environment. SLAM can be posed as a nonlinear optimization problem on a graph of poses. We propose a technique for rapidly optimizing these graphs given a set of constraints. As published in ICRA2006. Our project aims to extract, model, and provide access to the semantic, topological, and geometric data of the entire MIT campus. Using nearly 1000 floor plans representing 37,000 spaces on the MIT campus, our software models the fine-grain geometry of the campus, and builds a graph network representing space connectivity within the campus. Lastly, we provide an API that allows for straightforward access to this data via the web. 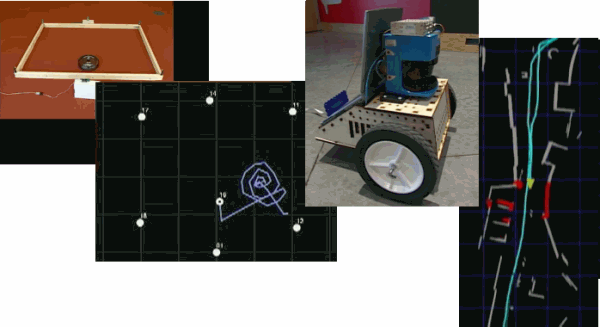 We are developing a sensor pack and associated algorithms to enable a robot, or hand-held device, to construct a map-like representation from a narrated, guided tour. The idea is that a human user would "show" the device around a space, associating spoken labels (names) with specific locations and objects within the space. The device could then produce names from (later observations of) locations or objects, and (routes to) locations or objects from supplied names. Our primary goal is the ability to model complex motion and occlusion. We want the algorithm to handle general video, which may include close-ups of people talking, hand-held camera motion, multiple independently moving objects, textureless regions, narrow fields of view, and complicated geometry (e.g. trees or other clutter). A particle approach provides this kind of flexibility. We have developed a graph partitioning algorithm which can identify a cluster of maximally-consistent points, rejecting those points which do not belong to a consistent set. This is in contrast to typical graph partitioning methods which assume that all points belong to one of K clusters. There are numerous robotics applications, including outlier rejection, feature detection and estimation, and data association. As published in RSS2005. This page describes a method for bringing two videos (recorded at different times, along similar but not identical camera paths) into spatiotemporal alignment, then comparing and combining corresponding pixels for applications such as background subtraction, compositing, and increasing dynamic range. We have also developed a prototype change detection system based on the method. We have gathered and combined several legacy "as-planned" CAD models of the Stata Center interior (2D) and exterior (3D), and combined them into a single 3D CAD model of the building. The model is "as-built;" it incorporates thousands of field measurements of the actual locations of walls, floors, ceilings, doors, and interior and exterior windows. It contains 3D wall surfaces extruded from the 2D floorplans. Both vertical, non-vertical, planar and non-planar walls are represented. The students' reports, and the full model (in DXF format) can be found here. We are developing an "organic" indoor location discovery service, in which each user in an extended community contributes a small amount of location-specific information (in our case, WiFi signature data) which can then be aggregated to support location discovery for other users moving through the same space. The students' progress reports, and example open-source code and data, will be archived here. We are working with The Boston Home, a facility for people with MS, to develop an assistive wheelchair. The wheelchair will: provide communication between residents and staff; will localize within and around the facility; and will provide autonomous mobility under speech or other command mode. Our progress will be logged on our wiki. Online list of RVSN publications as available. Most autonomous underwater vehicles (AUVs) rely on fixed navigational beacons whose locations are known in advance. We show how AUVs can build maps dynamically without any prior knowledge, using only range data. As published in AUV2004.